A few years ago, I would never have believed Jordan Peele was on track to becoming a horror auteur. His sketch comedy days lasted over a decade and the attempts at horror comedy in later seasons of Key & Peele were mostly terrible, so when Get Out hit theaters two years ago I treated the title as an instruction. After seeing Peele walk away from that project with a screenwriting Oscar, rare for the genre, I decided to witness his horror magic in Us. I’m glad I did. In Us, a typical American family is terrorized on vacation by a family physically identical to them, but with murderous intentions. These are the family’s “shadows,” feral doppelgängers whose lives are dictated by the choices of their counterparts. Being denied their free will for their whole lives, the shadows decide that the time has come to “untether” themselves by killing their ordinary lookalikes and claiming the ability to control their fates. For the most part the shadows are one-dimensional villains that do not appear to demand too much from their actors. Luckily the stars get to shine as the Wilson family, with realistic banter that includes sarcasm while the family helplessly tries to deal with their stalkers. The mixture of dialogue and action is some of the best since Super 8, even once utilizing that film’s trick of having multiple conversations be spoken over each other during a meal. The frequent humor is also great and unobtrusive as the jokes evolve naturally out of the Wilsons’ situations. The shadows are not scary because of their particular actions (they are violent, but not to the point of the typical slasher film), but because of their motivation. The idea of a dashing, golden-haired man who hates me with every fiber of his being popping up behind me in the theater and attacking me with a giant pair of scissors kept me on edge throughout the film. Us also uses its multiple villains to keep the film interesting by becoming something of a reverse-slasher. Typically, the fun of horror movies is to see how the killer creatively eliminates their targets or how those targets evade them. With just as many hunters as hunted in this film, the kill-count can go both ways as the Wilsons fight back against their shadows. As is expected of Peele and co-producers Jason Blum and Sean McKittrick, the film is incredibly well-made. The opening in particular, a seeming homage to The Lost Boys, casts an unsettling air on the joyous-looking mid-80’s Santa Cruz Beach Boardwalk. Paranoia pervades every scene even before the shadows arrive to wreak havoc on the Wilson’s quaint waterfront home. Michael Abels’s music deserves special attention. The action is mostly scored with the sharp strings that predominate the sound of modern horror films, but the main theme is a beautiful and haunting piece reminiscent of Kenji Kawai’s score for Ghost in the Shell (something about choirs and folk instruments just lends itself well to reflecting upon what it means to be human). Unfortunately, the music loses the respect its visuals owe it during the film’s climax, a “dance” that wants to be a flurry of choreographed terror but relies entirely on jump-cuts instead of careful movement by the actors. You can practically hear a voice behind the camera saying “we’ll fix it in post”. The only other big disappointment in Us is one setting where the uneasy aura of the film disappears where it is needed most. The movie spends so much time filling your head with ideas of how dreadful this place could be without coming close to the imagination’s limits of misery. Still, Us is a film that kept me constantly entertained, both laughing and keeping an eye on the nearest exit. Unlike in Get Out, Peele’s message is kept below the surface of the plot, and the African-American lead characters are made to be relatable for people from any walk of life. The film’s freaky concept, something I was worried would be a lame gimmick, is strong enough that it could work in any story setting. Us earns a Crier Rating of 8.5/10. 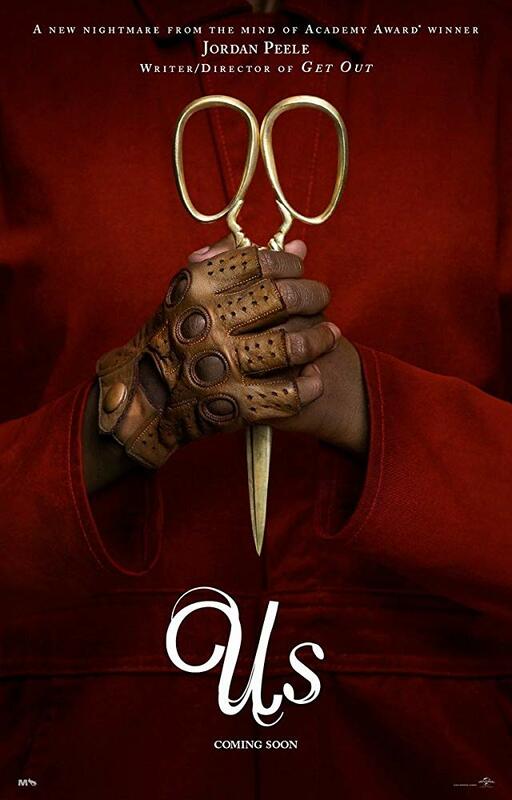 The poster for Us depicts Lupita N’yongo’s shade holding a threatening pair of shears.